West Virginia state law greatly restricts the ability of cities and towns to adopt creative solutions to the challenges and opportunities they face in their local areas. The West Virginia Municipal Home Rule Pilot Program allows cities to apply for authority to implement specific ordinances, acts, resolutions, rules and regulations without regard to state laws, with the exception that proposals had to comply with the U.S. Constitution, the West Virginia Constitution, federal law, chapters sixty-a (“uniform Controlled Substance Act”), sixty-one (“Crimes and Their Punishment”), and sixty two (Criminal Procedure”) of the West Virginia Code. In the fall of 2015, with a deadline fast approaching for application, the City of Elkins worried that it might lose its opportunity to join this exciting program. With just one week’s lead time, I reviewed the successful applications of all other accepted cities and crafted an application for authorities to address the particular problems Elkins wanted to work on. 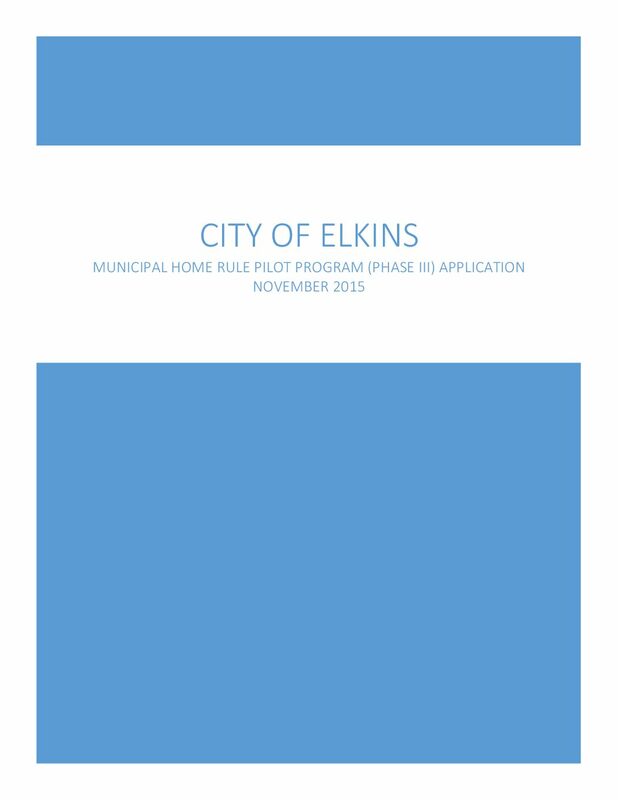 The City of Elkins was one of only eight cities accepted into the program that year.